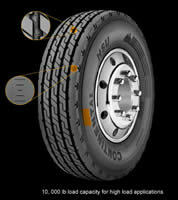 cut and tear resistant tread compound provides excellent wear in both high scrub and on/off road applications. New sidewall curb rib reduces damage from curbing, cuts and abrasions. Extra deep 24/32 aggressive rib design with extrra wide tread and optimized footprint provides excellent traction and long tread life.